This workshop challenges participants to abandon their outdated ideas on leadership and learn potent new practices that they can immediately use to inspire their teams and organizations to higher levels of performance. The day of the highly-structured organization with a clear strategic plan, a stable market and an unconditionally loyal workforce is over. Recognizing this, today’s most enlightened companies have stopped looking back at antiquated leadership models, choosing instead to focus on creating a new breed of independent, dynamic and agile leaders at every managerial and supervisory level. This two-day, intense, personal development experience, which is delivered by Bluepoint Master Facilitators, has been designed to equip leaders to step up to the many enormous opportunities that the future holds. 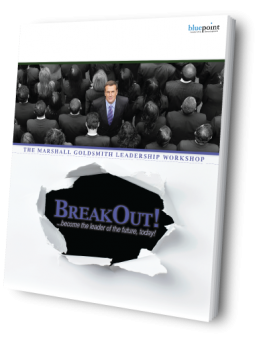 Want to find out more about BreakOut! ?